Jerry Vickery became a limo driver to fill his spare time. But since taking the reins last year of this longtime Rockford company, he’s accelerated the company’s commitment to excellence. After he retired, Jerry Vickery had extra time on his hands. A friend urged him to take on some part-time work driving for Classic Limousine, 5024 Willow Creek Road, Machesney Park, Ill.
Vickery admired the way then-owner Randy Samples required drivers to be neatly dressed, polite and always dependable. He also liked the way Samples made sure the vehicles were spotless and the customers were satisfied. “I really enjoyed being associated with the business. So, when Randy decided to sell, I worked things out to buy it,” Vickery explains. Samples founded the business in 1995, and Vickery took the reins in February 2014, determined to keep standards high. But he also made a few changes. For one thing, he raised the visibility of Classic Limousine. He joined the Rockford Chamber of Commerce and purchased more advertising, which has paid off. Marketing has been effective because people who wouldn’t normally think of taking a limousine need only look at the value proposition to be convinced, says Vickery. For example, six adults going to O’Hare together pay $185, or about $31 each, for a stretch limo ride (one-way). Adult bus tickets are $21 each (one-way), and if you drive, tolls and parking fees add up. Limo service is available 24/7, with no upcharge for night hours. “If you have an early flight, we’ll pick you up at 3 a.m. – whatever time you need,” Vickery says. Getting the word out is paying off. Now that Vickery is getting his wish, he’s working through the growing pains. “We’re at least two cars short,” he says. “I’m networking with some people in the limousine sales business right now.” The business already runs 10 vehicles, including a 14-passenger SUV limo, a 16-passenger bus limo, six- and eight-passenger limos and two-passenger sedans. He has 19 contracted and carefully screened drivers working for him; 17 are age 50 or older, and several have been with the company for many years. “They like the way they can request to work during certain hours,” says Vickery, who still takes driving shifts himself. “Some want to drive only on weekends or only early mornings, and so forth.” Only the limousine bus and SUV require a special driver’s license, which several of Vickery’s drivers possess. Keeping track of the busy schedule are two office employees. Pam West has worked for the business 15 years, and Dan Bement, who began as a driver three years ago, moved into the office a few months ago. Among other tasks, the duo chart each trip on a wall-sized, color-coded whiteboard that all drivers can easily view. Vickery also employs a young man who keeps the vehicles clean and looking sharp. While people may think of limousines mostly in connection with weddings and proms, more than 50 percent of Classic Limousine’s business involves driving people to and from various airports. It’s all about time and convenience, says Vickery. Of course, not all of Classic Limousine’s customers are business executives. Some of them are, well … rock stars. Along with airport runs, Classic Limousine specializes in transportation for weddings, funerals, proms, bar-hopping parties and chartered events. Its normal service area is a 100-mile radius of Rockford. Funerals are another occasion when limousine service is deeply appreciated. Family members find comfort in being together in a large vehicle that can accommodate them, and no one in the party needs to think about driving. Classic Limousine works with several funeral homes to offer whatever is needed. Bar-hopping parties comprise another segment of Vickery’s business. “People like us to take them from one stop to another, maybe in Chicago, Madison or Milwaukee, and get them safely home,” says Vickery. So what happens when a vehicle breaks down? “We have an in-house mechanic and, if there are any major problems, we also have an excellent mechanic less than a mile away, who has a large enough hoist to handle these vehicles,” he says. It’s all part of knowing the ins and outs of a limousine service business. Born and reared in Rockford, Vickery lived in many cities throughout the Midwest after college. He moved back home to help out his parents when they were approaching old age. 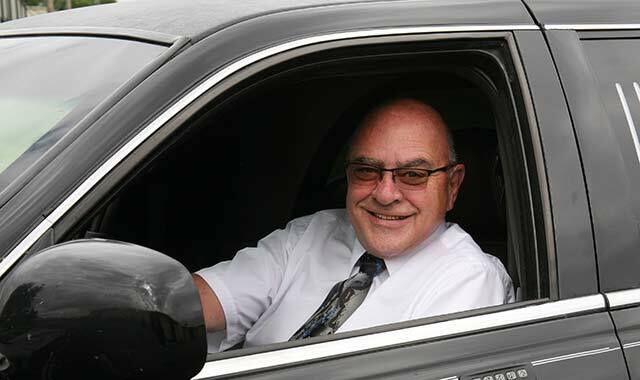 Upon retirement, he never imagined he’d be learning to run his own small business or traveling to conventions to learn about the best practices in the limousine industry. This entry was posted on Thursday, August 27th, 2015 at 11:56 am	and is filed under Northwest Business Magazine. You can follow any responses to this entry through the RSS 2.0 feed. Both comments and pings are currently closed.